Learn Reiki in Vancouver. Reiki Classes and Training with Reiki Master/Teacher Myorei Zeraffa. Certified by Canadian Reiki Association. Reiki gives us tools to develop the deep and difficult skill of how to walk in beauty. See the Vancouver Reiki classes calendar for next dates. Reiki classes are kept to a maximum of ten students. This small, dynamic number allows for personalized instruction and lively exchanges. A full manual is yours to take home, no need to take notes (unless you wish to). We pause around mid-class and share a vegan organic light meal prepared with love. Classes are small and fill fast, please send your deposit as soon as possible to reserve your seat. Tuition balance is due the day of class. Private guidance for a deepening of your Reiki practice after you have taken a Reiki class. If convenient, we can connect online through Skype. Sharpen your energetic skills, renew your attunements. Clarify and deepen your Reiki experience. We will explore any question/concern you might have encountered in your practice. We will arrange a special time to connect. Reiki training in small personalized classes. Reiki is easily learned by everyone. After being attuned to the Reiki energy at the first level, you can use it to self-heal and heal others. The most important part of each Reiki class is the empowerment/attunement - tuning into the Reiki energy. We are all already connected to Reiki, the life force of this universe: we are alive. Each Reiki class, each attunement increases this connection. It is a process of remembering and exploring our innate ability to connect with the universal force within and all around us. This is a going back to harmonious presence. The path of Reiki is to return to our original wholeness. Through the progressing levels, the healing energy of Reiki permeates body, heart and mind and is thus a path of spiritual awakening. I teach Usui Reiki in 4 levels. You are guided through these to the master/teacher level of Usui Reiki. Class size is kept to a maximum of ten students. This allows for personal attention and great interactions, your questions will be welcomed and you will practice all that is taught. Practical experience leading to an inner understanding is emphasized. Much of the classes are spent working from this viewpoint, teaching you to work intuitively and effectively with the Reiki energy. You are encouraged to continue practising after the classes finish. Each class is considered to be an introduction to that level, healing and re-connecting with a holistic self takes time and effort. Consequently ongoing support is offered to all students after the classes. I am available to my students and engage in the relationship as much as they will allow. My goal is to develop a realistic relationship that empowers you. I do not have your answers, you have to select and walk your path. I am here to speak out of my own experience, to encourage you and guide you towards your own truth. I always remember that as I teach, I am also being taught. When taking level 1 + 2 in the same weekend, tuition is $550 for both classes, tax included. noon to 8pm - See the Vancouver Reiki Classes Calendar for upcoming dates and to register. With the Reiki level I empowerment you discover a very intuitive, natural and powerful tool to help yourself and others. Reiki provides you with the necessary energy and strength to face your own imbalances, to remove resistances stopping you from manifesting the beautiful being you already are. After your attunement it is as simple as connecting to Reiki with intent, placing your hands, and the energy flows. The focus is on your own healing journey with a strong emphasis on self Reiki treatment. It is by first healing yourself that you can truly contribute to this world. 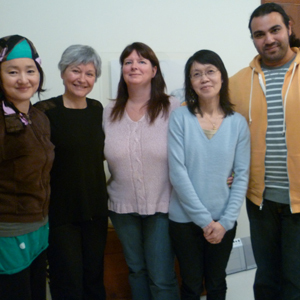 In this 8 hours Reiki class held in Vancouver, you become initiated into the system of Reiki. There is no pre-requisite; absolute beginners to energetically experienced practitioners are welcomed. You are empowered and learn a solid foundation to practice Reiki for life. At the end of the class, each student receives a very complete Reiki manual that includes all of Reiki Level I information. Each student receives a Usui Reiki Level I Certificate. noon to 7pm - See the Vancouver Reiki Classes Calendar for upcoming dates and to register. At the second Reiki level you'll experience a noticeable deepening. It involves a further Reiki empowerment that connects you to the frequency of three Usui Reiki symbols to enhance treatments, for personal growth, for long distance healing and for many daily applications. This Reiki level assists us to integrate Earth and Sky energies and remember who we truly are, the beautiful human being in between. It is a major step to becoming fully integrated, and we are given the tools we need to heal in a very effective way. The focus is on physical, mental and emotional development. Healing with Reiki is brought to a deeper level. Each student receives a Usui Reiki Level II Certificate and a manual including all the information reviewed during the class. This 8 hours Reiki class is held in Vancouver and suitable for level I practitioners who have experienced the power of Reiki in their lives and choose to deepen their commitment to bringing about balance and growth. It is open to all students who have taken a Reiki first level class. This is a very exciting hands-on class. You connect to the frequency of fourth Usui Reiki symbol and now have all the tools for your spiritual journey. We introduce crystals to the system of Reiki and learn aura clearing to shift unwanted energies. This 8 hours Reiki training class in Vancouver is suitable for Reiki level II practitioners to expand and deepen their healing practice. It is open to students who have taken a second degree Reiki class and have had a practice of self Reiki for a minimum of 3 months. At the end of the class, each student receives a Reiki manual that includes all workshop information, a beautiful crystals set to start a Reiki grid, and you are presented with your Usui Reiki Master Practitioner Certificate. By application. A Reiki Level 3 prerequisite with a consistent Reiki practice for more than 6 months is beneficial. 2 days: noon - 7pm - See the Vancouver Reiki Classes Calendar for upcoming dates and to register. At the Reiki Master level your connection to Universal energy becomes whole. The focus is on spiritual development and the last symbol in the Usui Reiki system of healing facilitates the experiential awareness of your spiritual nature, you shine your light into the world. In this 2 days Reiki intensive, you complete the circle and learn to empower others into Reiki, to do the attunements. It is suitable for those wanting to immerse themselves in the Reiki path. You acquire all the tools needed to engage in a lifelong journey of Reiki practice and teaching if you choose to do so. If you are interested in becoming a Reiki master please contact me. You learn and practice until you are completely comfortable performing all the empowerments to initiate others into Reiki. We explore what it means to be a Reiki teacher, the role and responsibilities. We practice environmental cleansing and protection. I share with you all my professional tips and tools. At the end of the seminar, each student receives the Reiki Master Class Manual. You are presented with your Usui Reiki Master / Teacher Certificate.